Many of our zucchini and squash plants have once again become the victims of squash vine borers. It is SO frustrating! Like last year, we got a few awesome zukes and straightneck squash before we noticed the ominous wilting beginning to take place. I was so excited, I even finally caved and bought a spiralizer! Sigh. I guess I should be thankful that some of the plants seem to be surviving (knock on wood) and that we got enough zucchinis to make an awesome batch of zucchini bread. I followed this recipe pretty closely, though one change I made was to use coconut oil in place of some of the butter. I love that stuff and the subtle coconut flavor it contributes. This bread tastes great. I've made some awful zucchini bread in the past--too dense or too bland, and on it goes. I think draining the zucchini a little bit is a necessary step--if your veggies are too wet, your bread will take forever to bake and won't result in the fluffy tender crumb you see before you here. Don't skimp on the spices, either--this bread can take loads without those flavors becoming overwhelming. My hopes for you are three-fold: I hope you make this bread, I hope you enjoy lots of zucchini this summer, and I hope that if you're growing your own zucchini, you don't ever have to deal with those evil, awful, disgusting, and destructive squash vine borers. Spray or grease and flour two 8x4- or 9x5-inch loaf pans liberally. Place the grated zucchini in a sieve or colander over a bowl to drain any excess moisture. In a large bowl, whisk together the eggs, melted butter, oil, and sugar, then mix in the zucchini and vanilla. In another bowl. combine flour, cinnamon, nutmeg, baking soda, and salt. Add the flour mixture, a third at a time, to the wet mixture, stirring after each incorporation. Fold in the nuts. Divide the batter evenly into prepared pans. Bake loaves for 50 minutes, plus or minus ten, or until a tester inserted into the center comes out clean. 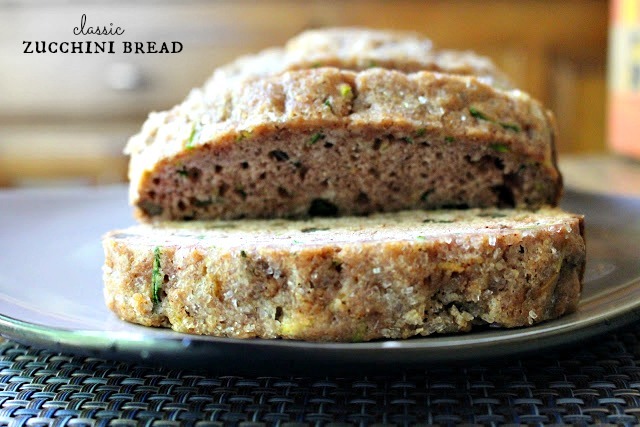 My cats destroyed my zucchini plant..and I could only hope that the plant wasn't poisonous for them...sighs...your zucchini bread looks very good...love its soft and light texture. There was not a zucchini in sight at my supermarket last weekend. I love zucchini, and zucchini bread, too! Yours looks terrific. We've given up trying to grow them - might have to buy some for this bread though! I love the close up of the sugar. Looks so yum! I gave up on squash years ago for the same reason. We get an occasional crop from the compost bin--and plenty from the CSAs. I now use coconut oil in place of butter or oil in most hearty baked recipes, including my zucchini muffins. My kids actually liked them better when I started that including my youngest who swears she hates coconut in any form! Home gardening is always such a challenge. Every year, I hope I get a few peaches before the birds peck them all or that the pests don't eat a million holes in my basil leaves. Sigh. But when you get a great fruit or veggie from your own two hands it's so special. Your zucchini bread looks like the perfect showcase for all your hard-won effort. Great recipe, will have to try this out sometime this week! Thanks for the post, will have to try this recipe out! So sad for you..... Hopefully you have a great local farmers market where you can pick up what you are missing out on. Recipe sounds great. Some zucchini breads are so high in oil, I don't end up feeling good about the recipe. Yours I can feel good about!